Visiting the Hershey, Hummelstown, Middletown or Harrisburg area in Pennsylvania? Are you looking for a family-friendly casual dining experience that is affordable? If so, we suggest you visit Hoss's Steak and Sea House located in Hummelstown, Pennsylvania. This is a casual family dining restaurant that serves various steaks, seafood and chicken entrees. You can get various sides or try out their all you-can-eat soup and salad bar. They have a great adult dining menu and about 8 tasty entrees on their kid's menu. When ordering an adult entree, the soup, salad and dessert bar is included in your entree price. What a deal! On the day we visited we got steak and shrimp dinners which were delicious and cooked to our liking. We also got the included soup & salad bar which had various salads, coleslaw, potato salad, macaroni salad, pasta salad, various fresh baked breads, fresh fruits, ice cream bar, fresh baked brownies, cookies and even a delicious peach cobbler. If soups are your thing...the day we visited they had 4 different freshly made soups, including chicken noodle soup! We had 4 adults and 1 child in our dining party and only waited 15 minutes on our dinner to arrive at our table. During that 15 minutes we dined on some yummy salads, fruits and soups from the salad & soup bar. After our dinner, we hit up their desserts and tried ice cream sundaes, brownies and peach cobbler. All were delicious and tasted better than homemade! The restaurant is beautifully decorated, plenty of seating and very clean bathrooms. Our total check was around $65 and like I said, we had 4 adults and 1 child in our dining party. We feel the food was delicious and definitely affordable for a family of 5 people. 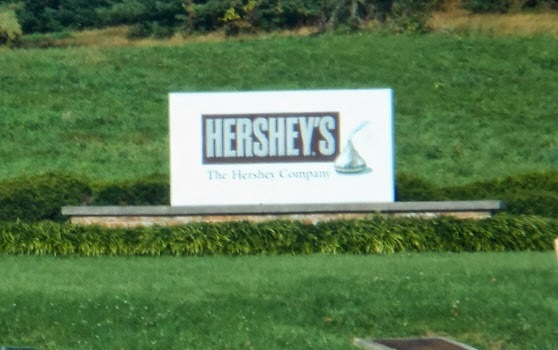 Earlier in the day we had visited Hershey's Chocolate World and the Tanger Shopping Outlet and Hoss's is about a 10 minute drive from both of those locations. If you are heading there from Harrisburg, about a 10 minute drive from there too. There is plenty of free parking right out front of the restaurant and the parking lot is well-lit and secure. 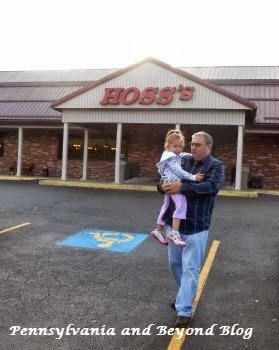 Overall, we give Hoss's Steak and Sea House in Hummelstown, PA. a 9 out of 10 stars on our rating scale. Our meal arrived quickly to our table, the restaurant is very clean, everything tasted delicious and it was very affordable. We highly recommend that you check them out when in the Harrisburg, Hummelstown or Hershey area.